A close up view of an exceptional padparadscha sapphire, showing that special mix of orange and pink which the stone needs to qualify as such. The lotus flower, from which the padparadscha sapphire derives its name. 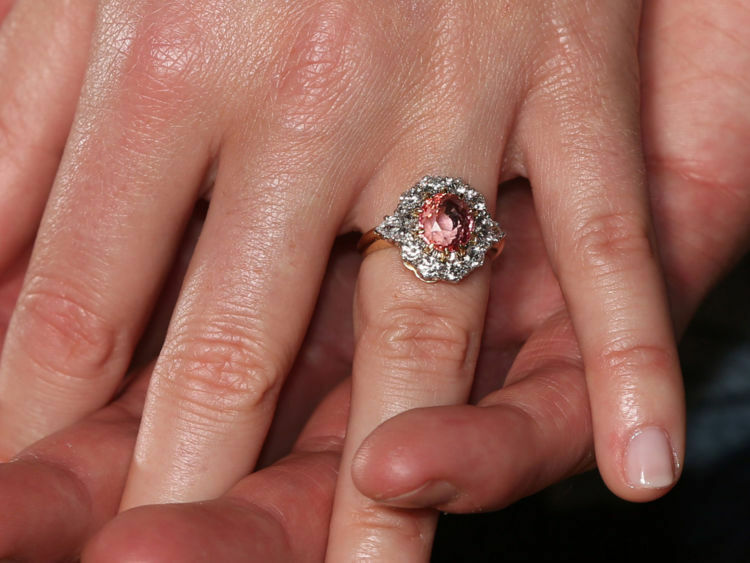 When Princess Eugenie announced her engagement ring to Jack Brooksbank she showed off an engagement ring set with one of the most special sapphires available to gem collectors: a padparadscha sapphire. The name is almost unpronounceable (you literally have to say it a syllable at a time) and it derives from the Sinhalese word for lotus blossom. 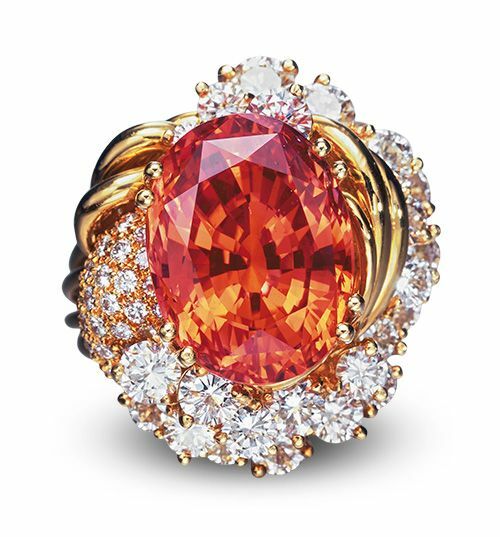 We know that sapphires come in every colour under the Sun- but for a sapphire to qualify as padparadscha it needs to exhibit a very particular shade which is a mixture of a delicate pink and orange. Otherwise it is just a plain old orange or pink sapphire, which are plentiful. A genuine padparadscha is very rare, fetching higher prices than the finest blue sapphires. The world of coloured gems is extremely subjective and the sapphires of this elusive hue divide camps more than most other coloured stones. Padparadschas are most commonly found in Sri Lanka and some purists argue that to qualify as such this is where the stone must originate from. However, examples have been mined in Vietnam and East Africa. 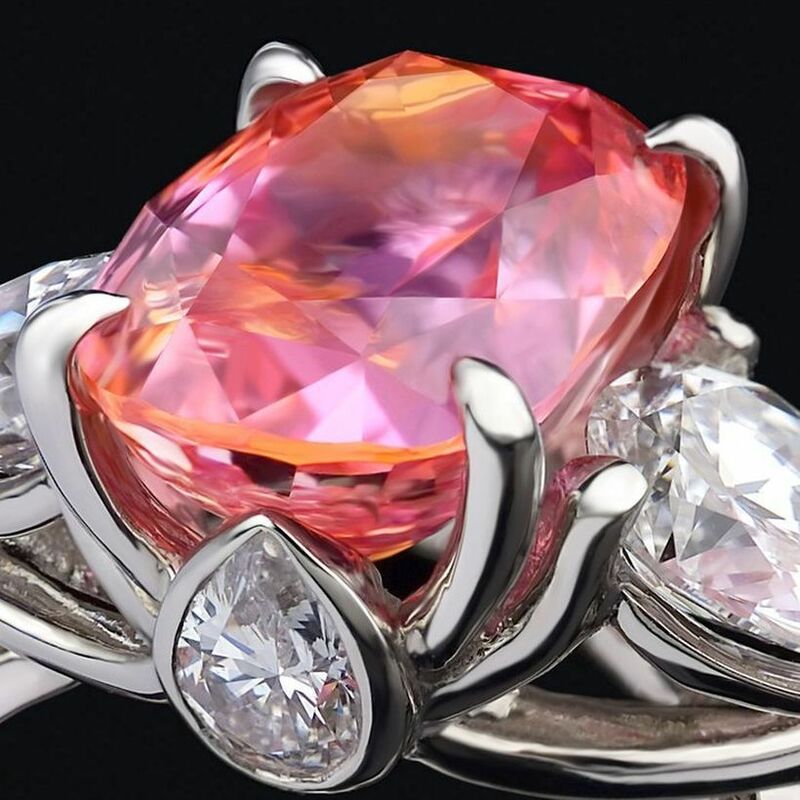 The special hue of orange and pink comes from trace amounts of chromium and iron in the crystal. I would personally argue that if the chemical make up is identical to that of Sri Lankan stones it qualifies as a padparadscha. A record breaking stone: this padparadscha sapphire weighing 20.84 carats fetched over $375,000 at auction in 2005. Experts also argue on the level of pink or orange the stone must exhibit to qualify as a prime example: orangey-pink or pinkish-orange? Very orange with a touch of pink or vice versa? If you are interested in buying one and want the genuine article it is best to insist on buying a stone certified by a reputable laboratory, such as GIA. The price increases exponentially with the saturation of the colour and the carat weight. Again, colour here is subjective- you don’t want a stone so strong that none of the light and clarity has a chance to shine through. You want a stone that has that ‘limpid’ quality, or what used to be known as ‘water’ in the old days. Personally, I like padparadschas that are just a shade stronger than pastel. As with the majority of coloured stones on the market it is not uncommon to see heat treated examples on offer. These stones are so rare that treatment is common to enhance the colour- even the treated examples, if they are of good quality, will command prices of several thousand dollars a carat. They are not stones that are easily available in large sizes; anything over two carats is rare, anything over five is newsworthy. Padparadschas continue to enthral because they are genuinely rare- if you are ever lucky enough to possess one, you will be completely fascinated, as its dual tonality can make the colour look quite different under different light sources.